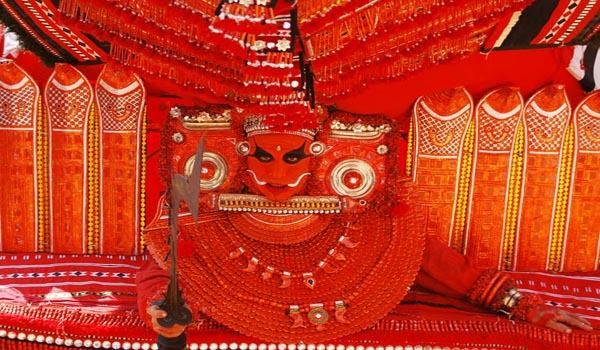 Theyyam is a popular Hindu ritual dance form of worshiping in northern Malabar region of Kerala.Theyyam originated from “Kaliyattam” once practiced by the tribal community of north Kerala. As a living cult with several thousand-year-old traditions, rituals and customs, it embraces almost all the castes and classes of the Hindu religion in this region. The performers of Theyyam belong to the lower class community, and have an important position in Theyyam.People of these districts consider Theyyam itself as a God and they seek blessings from this Theyyam. According to legends Parasurama sanctioned festivals like Kaliyattam, Puravela and Daivattam or Theyyattam to the people of the North Malabar region. He also assigned the responsibility of performing the Theyyam dance to the indigenous tribal communities like Malayar, Panan, Vannan and Velan. The dance is done in front of village shrine or temple.There is no stage or curtain or other such arrangements for the performance.The dancer along with the drummers recites the particular ritual song, which describes the myths and legends, of the deity of the shrine or the folk deity to be propitiated. This is accompanied by the playing of folk musical instruments.All the dancers take a shield and sword in their hands as continuation of the cult of weapons. Theyyam is one of the most fascinating theatrical arts of India. Comments are closed for Theyyam Dance.